From general maintenance work to production bolting applications, Chicago Pneumatic has an industrial impact wrench to meet your needs. 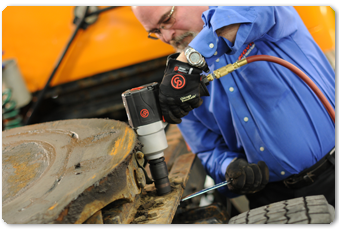 Few things matter more than maximizing productivity and whether you maintain a fleet of heavy machinery, or head up maintenance at a manufacturing plant; Chicago Pneumatic (CP) tools reduce operational downtime. Chicago Pneumatic impact wrenches and are offered in a wide range of versatile, robust,and user friendly designs. OEM replacement parts and tune up kits are are also available for all the Chicago Pneumatic Impact Wrenches on this site.